Typically I prefer a more clean, bold, solid look rather than shabby chic, rustic, or subtle look. What about you??? For this card though I decided to stamp on the background designer series paper rather than adding another layer. It like a whole new way of stamping for me. You should try it out! Stamping on Designer Paper is fun! Isn’t it beautiful?? Have I mentioned I also like flowers?!?! lol I love them so much I even created a Tag for easy search on all my flower cards. Just click here! I started with a Pool Party card base. Next, I took a piece of the Painted Seasons Designer Series Paper (Sale-A-Bration 2019) and adhered it down the center! Using the Painted Seasons Stamp Set and Tranquil Tide Ink, I stamped a few greenery pieces all around the top and bottom. This was done before layering the greeting and everything so it wasn’t in the way. Next, I added a little bit of adhesive in the center and pressed 2 pieces of the Pool Party Shimmer Ribbon into it. It is okay if the ribbon doesn’t seem super secure as the greeting will help hold it in place too! The greeting is from the Part of My Story (Sale-A-Bration 2019) Stamp Set and I punched it out with the Pretty Label Punch. Using Stampin’ Dimensionals, I added the greeting to the card front. Dimensionals adhere to the ribbon and the bumps and grooves much better than using Snail Adhesive. 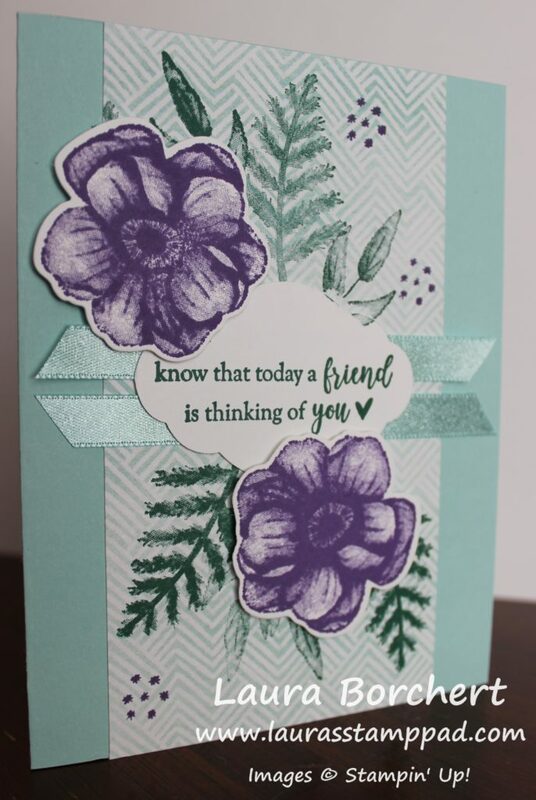 Next, I stamped and die cut the flowers in Gorgeous Grape using the Painted Season Stamp Set. I added the flowers with Stampin’ Dimensonals too. To finish it off, I stamped a few Gorgeous Grape star clusters all around. I really love how this card turned out and I am going to try stamping on designer paper more often now. What do you think? Hello Stampers!!! Do you like to color?? Do you have time to color?? I am somewhere in the middle. Sometimes, I don’t mind coloring a little bit but too much overwhelms me. I DO love bright colors and lots of colorful images though!!! Today, I’m sharing a card that is just that! Coloring the Lovely Lattice Sale-A-Bration Stamp Set would take some time but here I achieved beautiful color quickly! For this card, I started with a Real Red card base. Next, I took a piece of Whisper White (3-3/4″ x 5″) and stamped the Lovely Lattice image on the top of it. I used the Spectrum Pad which I inked up with the following colors: Real Red, Poppy Parade, Pumpkin Pie, Mango Melody, and Pineapple Punch. Since the image is rather large, I left the inks apart and inked across the image moving slightly up and down as I went across to ensure full coverage of ink. 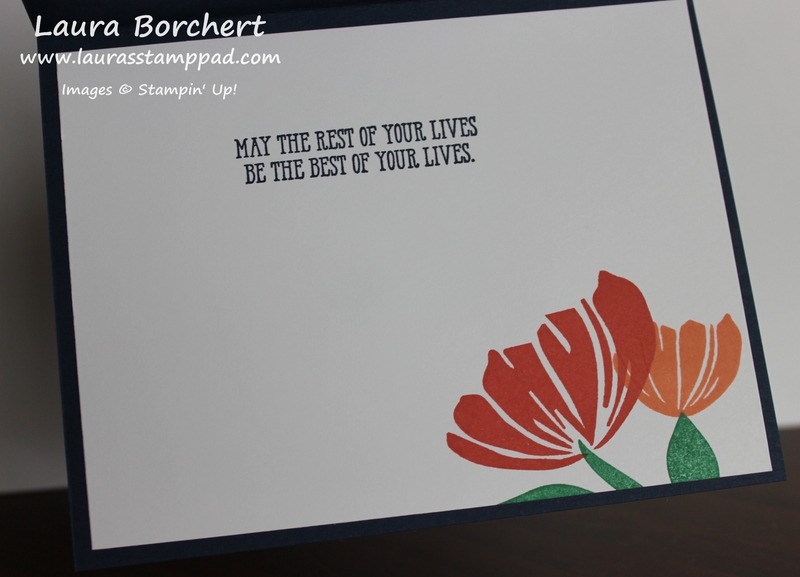 After stamping the image, I decorated and stamped the greeting on the bottom. I just couldn’t decide which one I liked the best. A simple greeting and some of the Gingham Gala Adhesive Backed Sequins or a greeting and some Pineapple Punch Ribbon. Then for the third one, I punched the greeting out with the Pretty Label Punch and brushed the edges in Real Red Ink with a Sponge Dauber. Which one do you like the best??? Don’t forget that Sale-A-Bration ends on Sunday so you only have a few days left to earn this amazing Lovely Lattice Stamp Set for FREE! Click here to start shopping! Today, we shall be celebrating happiness! It is Wednesday after all and the week is half over. That is not all though, there are so many things to celebrate that make us happy! Remember all the good things in life and don’t dwell on the things we can’t change or the tough things you are going through. Celebrate Happiness!!! I am loving this card and not just because it has a flower on it. I love the bright colors and all of the textures!! 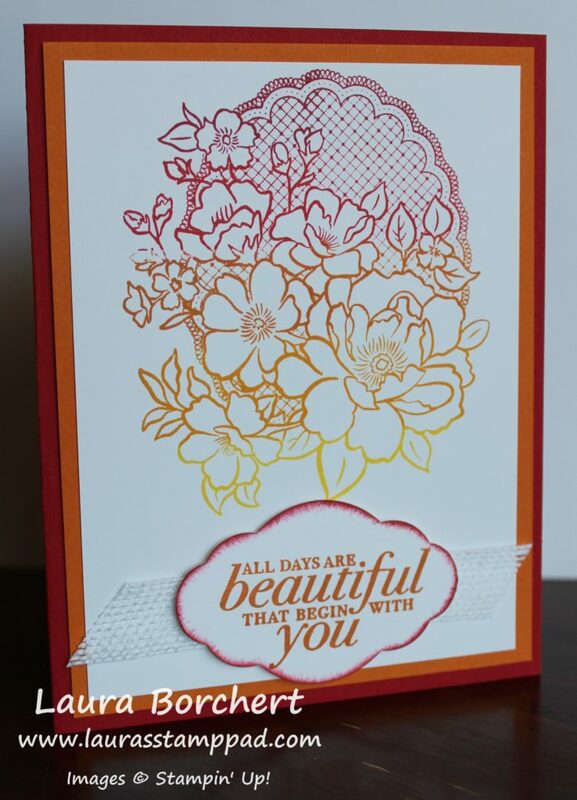 This card also uses the Free Stamp Set of the Month for March – Bloom By Bloom!!! All orders of $75 or more (before tax and shipping) earn this set for FREE! Click here to start shopping! 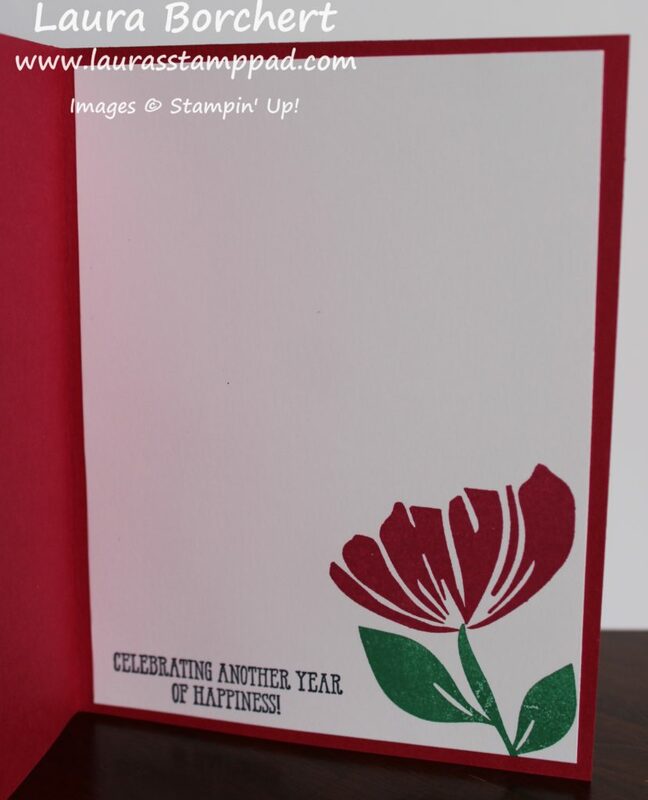 I started with a Lovely Lipstick card base and stamped the flower from the Bloom By Bloom Stamp Set all over. Using Lovely Lipstick Ink, it gives a nice watermark or tone on tone look. Be sure to fall off the cardstock so the pattern looks continuous. Next, I took a piece of the Happiness Blooms Designer Series Paper (2″ x 4″) and punched it with the Banner Triple Punch. I added it to the card front flush with the left side. Next, I took a piece of Whisper White cardstock and stamped the flower on it. Be sure to stamp the flower first and then the stem. This will ensure that the stem isn’t too high or too far over for the bloom to fit. The bloom was stamped in Lovely Lipstick and the stem in Call Me Clover. I added the greeting in the lower right corner from the Well Said Stamp Set. It was stamped in Night of Navy. I love the Well Said Stamp Set because it has perfect inside and outside greetings! I added a message on the inside as well as a little flower! Back to the front focal point! After stamping, I layered this onto another piece of the Happiness Blooms Designer Series Paper. Taking a piece of the Calypso Coral Satin Ribbon folded in half, I laid it across the banner on the card front. 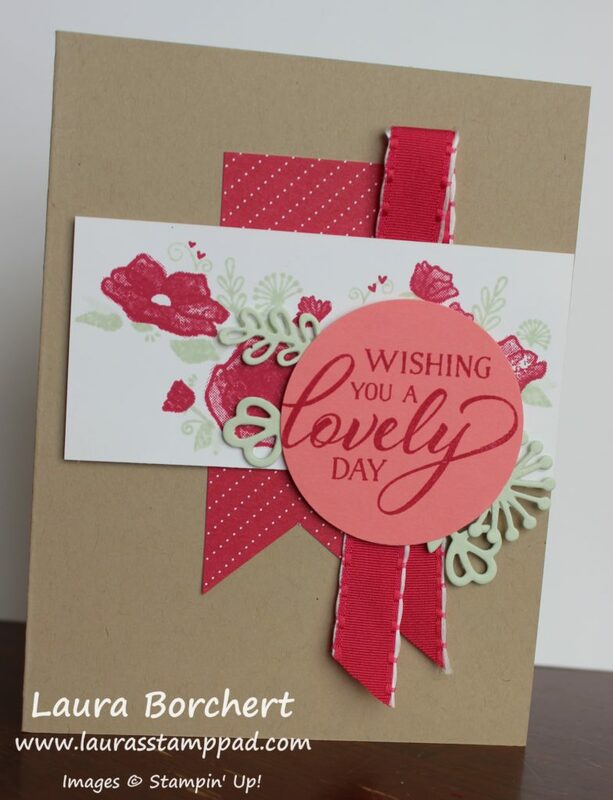 The Stampin’ Dimensionals on the stamped flower layer secure this ribbon loop in place just perfectly!! To finish off the card, I added some Enamel Shapes to the flower for texture! Just perfect! If you would like to recreate this card, click on the supply list below! Don’t forget that if your order is over $75 (before shipping and tax), you will get the Bloom By Bloom Stamp Set for FREE from me! Another fabulous offer…..I am starting Laura’s Quick Kits which are card kits with all the pre-cut cardstock and embellishments provided. All you need to do is stamp and assemble. The stamps, ink, and adhesive are not provided. Click here to get your first Laura’s Quick Kits – Bloom By Bloom! Happy Monday!!!! I hope you all had a wonderful weekend!!! While the card I’m sharing today is an anniversary one, this greeting could be for anything. May the Rest of Your Lives…..Be the Best of Your Lives!!! I have recently gotten into decorating the inside of the cards. I know, I know….I’m super late to the party but I’m here now!!! Isn’t this card just fabulous?? It’s the inside, just wait till you see the front! Flowers, Flowers, Flowers…..make me happy!!! These colors also make me happy! I am loving this combination of Night of Navy, Grapefruit Grove, and Calypso Coral. Yum! I started with a Night of Navy card base. Next, I layered on a piece of the Happiness Blooms Designer Series Paper (4″ x 5-1/4″). 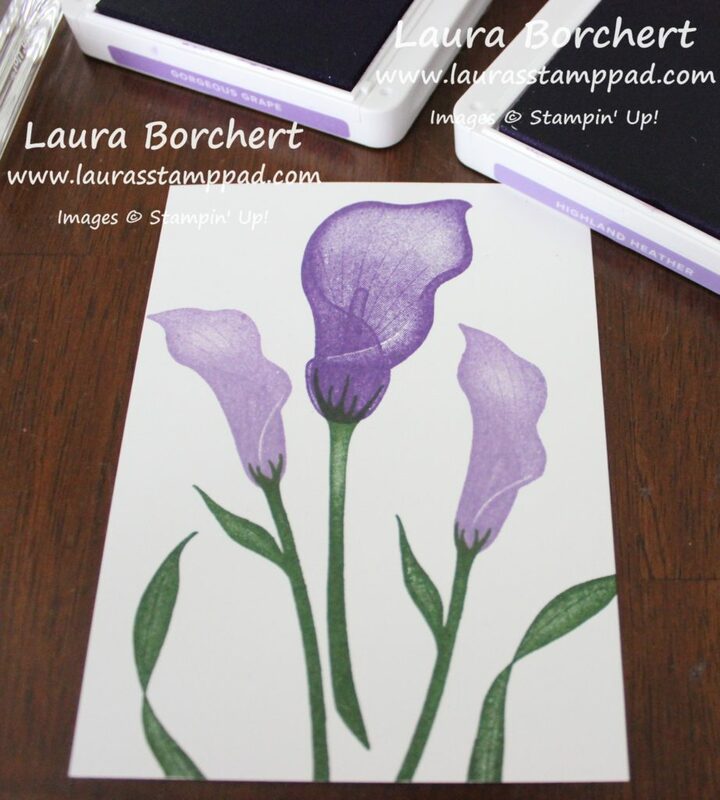 Then, I took a piece of Whisper White (2-1/2″ x 2-1/2″) and stamped the flower from the Bloom By Bloom Stamp Set. Be sure to stamp the flower first and then the stem to ensure your stem isn’t too high/too far over that your flower doesn’t fit. 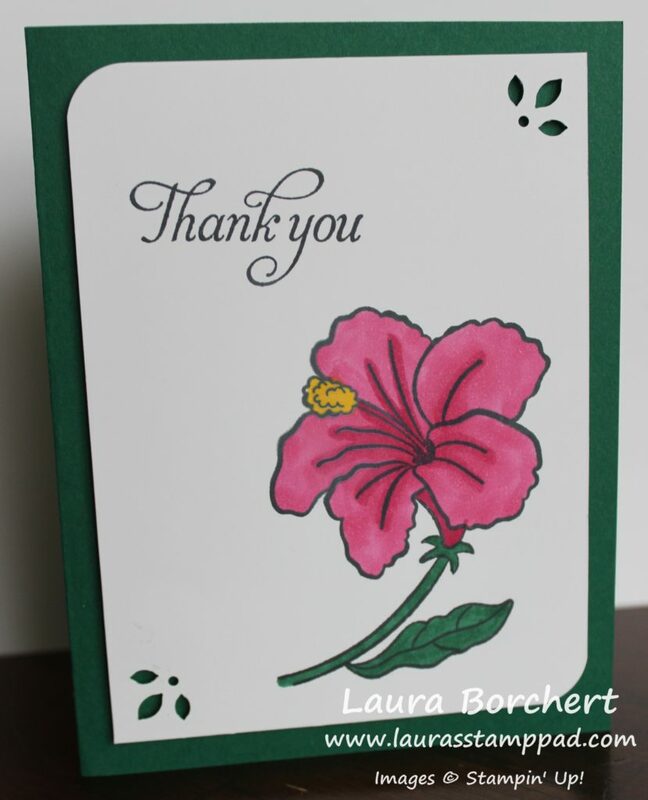 The flower was stamped in Calypso Coral Ink and the stem in Call Me Clover Ink. Then I took the smaller flower from the set and stamped it in Grapefruit Grove. I fussy cut out that flower and layered it onto the bigger one with Stampin’ Dimensionals. Next, I layered this onto a piece of Calypso Coral (3″ x 3″) and added a little loop of Calypso Coral Satin Ribbon to the corner. 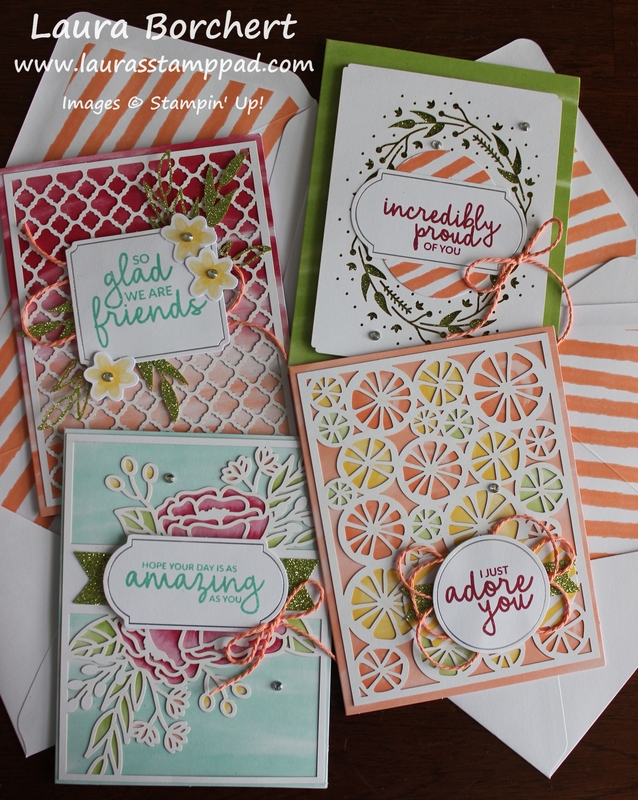 Securing the loop with Stampin’ Dimensionals gives a smooth and secure look! 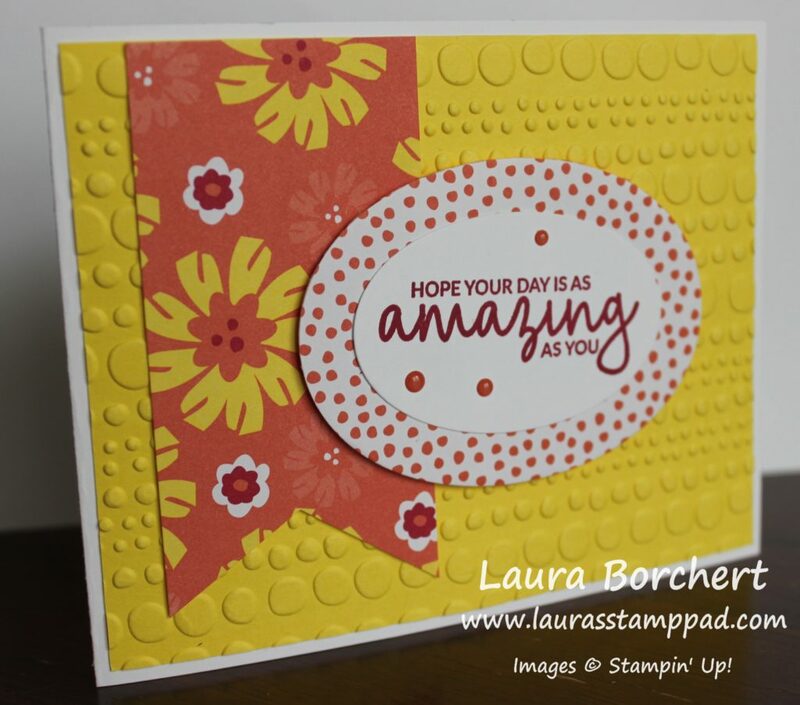 Add more Stampin’ Dimensionals around the piece and add it to the card front. For the greeting, I stamped it in Night of Navy Ink from the Well Said Stamp Set. Simply cut around the stamped images and add them to the card. If you wish to stamp directly onto the card next to the flower, you can do so. This just gives an extra pop and allows the greeting to fall off a bit. If you would like to recreate this card, click the supply list below! Don’t forget if you order is over $75 before tax and shipping, you will earn Laura’s Free Stamp Set of the Month which is the Bloom By Bloom Stamp Set! Woot Woot! It’s Monday and while that is a bit of a bummer that the weekend is over. It means a new start to a week and let’s make it a good one! After all it is the last week of February and one step closer to Spring! So put on a smile this Monday and know that you are amazing!!! Thank you to Jean Noellsch‎ for the inspiration for this card. Surely this beautiful bright card is going to make you smile!!! I just love flowers and bright colors. I’m also loving the Dot To Dot Embossing Folder right now too. It’s just so classic and goes with everything! I started with a Whisper White card base. Next, I layered on a piece of Pineapple Punch (4″ x 5-1/4″) that was run through the Big Shot in the Dot to Dot Embossing Folder! Using a strip of the Happiness Blooms Designer Series Paper and the Banner Triple Punch, I created the floral banner for the left hand side. Then using that same patterned piece, I die cut an oval with the Layering Ovals Framelits to back the greeting! The greeting was stamped from the Incredible Like You Stamp Set. To finish it off I added a few Happiness Blooms Enamel Dots. 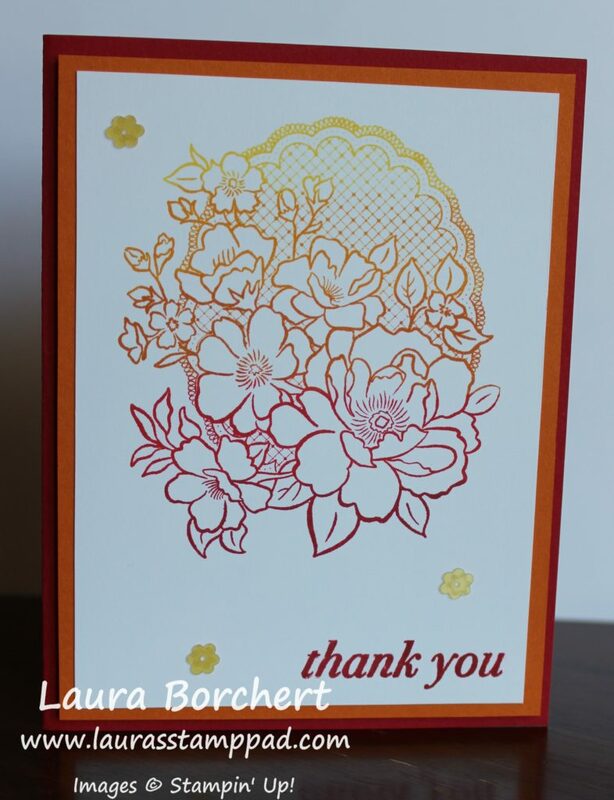 The greeting was added to the card front with Stampin’ Dimensionals for texture as well as the fact that they hold better on an embossed surface. I couldn’t decide whether it needed this little knot of ribbon or not. What do you think – knot or not?? Let me know in the comments below! If you would like to recreate this card, check out the supply list below! Don’t forget that orders of $50 earn a FREE Sale-A-Bration item!!!! I created a very similar card to this one a few months ago. I had some leftover card pieces already cut but wanted to use some of my new stamps! Here is what I came up with using the Humming Along Stamp Set from the Occasions Mini Catalog!!! I started with a Shaded Spruce card base. Next, I took a piece of Whisper White measuring 3-3/4″ x 5″ and stamped the greeting and flower from the Humming Along Stamp Set! Since I colored using Stampin’ Blends, I stamped in Memento Black Ink! For the flowers, I just played with various colors and shades and had fun with it. As always, I color with the dark marker first and then blend and fill in with the lighter marker. Which one is your favorite?? Let me know in the comments below! My Mom is a huge gardener. She loves to do and has a yard full of gardens with flowers, vegetables, herbs, and more! Me…..not so much! My thumbs are pink (only because that’s the ink color I use the most), not green! I do enjoy going to visit and walking around the yard looking at all of the flowers though! To see all of the color variations and what is blooming at different times of year is just amazing to me! Lilies are my favorite flower so if I ever did get a green thumb, I would have a garden of lilies! I am loving the Lasting Lily Sale-A-Bration Stamp Set. It is so elegant and real looking! I also love a stamp set with images and greetings. Not just outside greetings but this set has inner and outer greetings. BONUS!!!!! I love it! I started with this card using a Highland Heather card base. Next, I added a piece of the Gingham Gala Designer Series Paper (4″ x 5-1/4″). 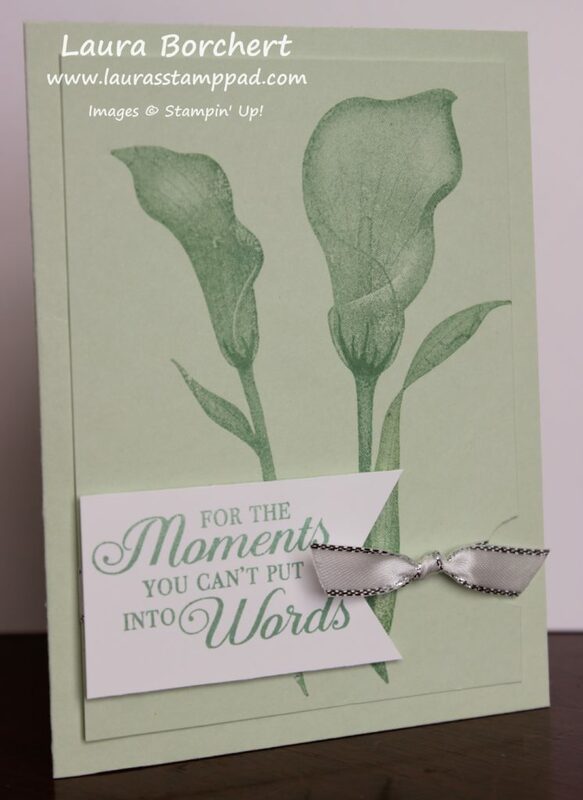 Then I took a piece of Whisper White (3-3/4″ x 5″) and stamped the lilies from the Lasting Lily Stamp Set. The center Lily was done with Gorgeous Grape Ink and the smaller ones in Highland Heather Ink. All the stems and leaves were stamped in Garden Green Ink. It’s okay if the stems and leaves look all over the place and like a mess because once you put the ribbon and greeting on, it just looks like a fabulous garden! See what I mean with the crazy stems and leaves. They look all over the place and floating. I didn’t add the leaves to the center stem because I thought it would look too crowded so I just added them around the edges. Once I was finished stamping, I added some Whisper White Classic Weave Ribbon and tied it into a knot. 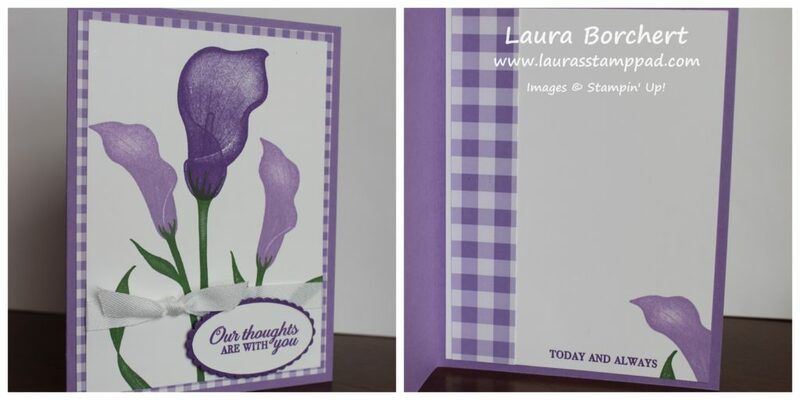 For the greeting, I used the Layering Ovals Framelits with Whisper White and Gorgeous Grape cardstock. The greeting was stamped in Gorgeous Grape as well. 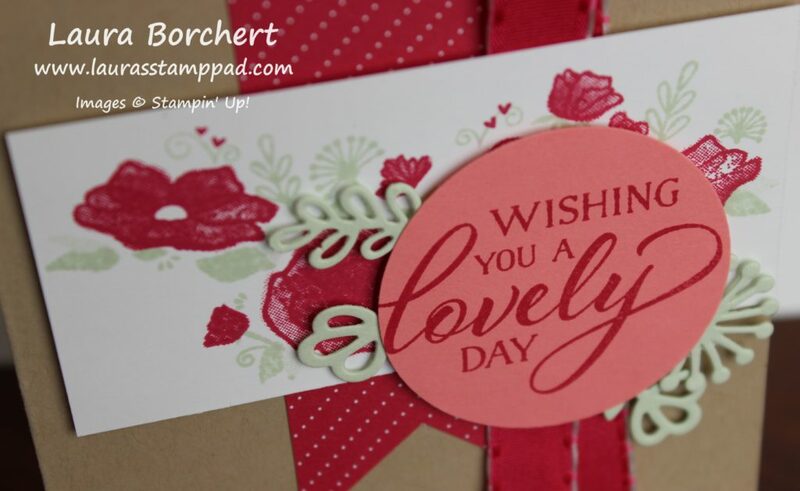 I added the greeting with Stampin Dimensionals. For the inside, I used a leftover piece of the designer paper along the left side and stamped a little flower and greeting! I’m all about decorating the inside of my cards lately. It’s weird because I never use to want to do that. I did this one in Grapefruit Grove and Calypso Coral Ink. I am loving it! Which one is your favorite?? Let me know in the comments below! Check out the supply list for these amazing cards below and remember you can earn the Lasting Lily Stamp Set for FREE with Sale-A-Bration!!! Laura’s Quick Tips: Did My Stamp Just Move?? Happy Tuesday, everyone! I have a little bit of a Technique Tuesday and a little Laura’s Quick Tips today! If this has happened to me, surely it has happened to you. I have my Stamparatus all lined up and ready to go. After stamping a few, I line up the next one and just as a go to stamp it down, I realize it is not lined up correctly. Did My Stamp Just Move??? 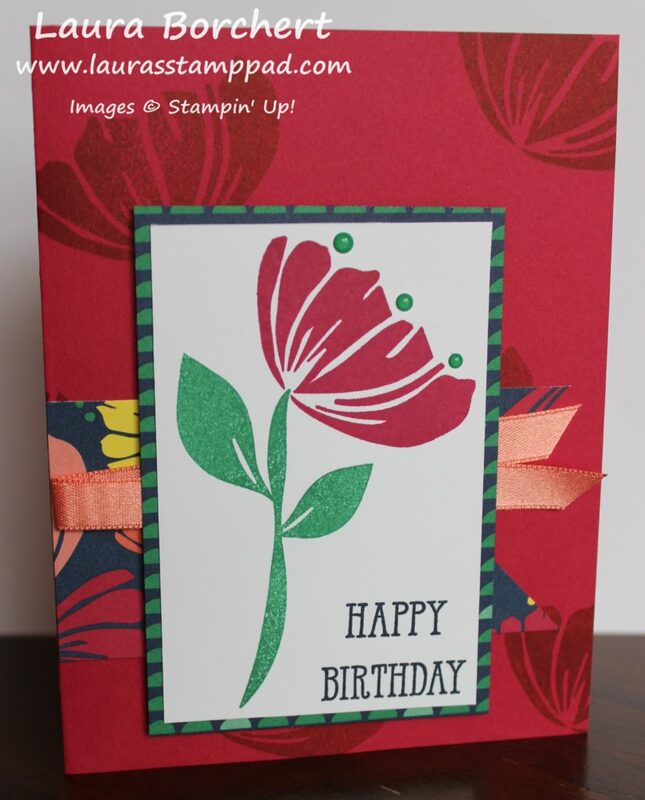 This fabulous card was created using the Stamparatus for that 2 step stamped image of flowers! The Stamparatus makes that image a breeze. One plate holds the folders for a fun color of your choice and the other plate holds the greenery piece! Boom Boom and you have a fabulous stamped image…..just make sure your grid and foam mat are in place! I started with a Crumb Cake card base and then added a 2″ strip of the All My Love Designer Series Paper. I punched the bottom of it with the Banner Triple Punch to get those banner tips! Next, I added a piece of the All My Love Ribbon by just putting a little bit of Snail Adhesive down the banner and pressing the loop into it. 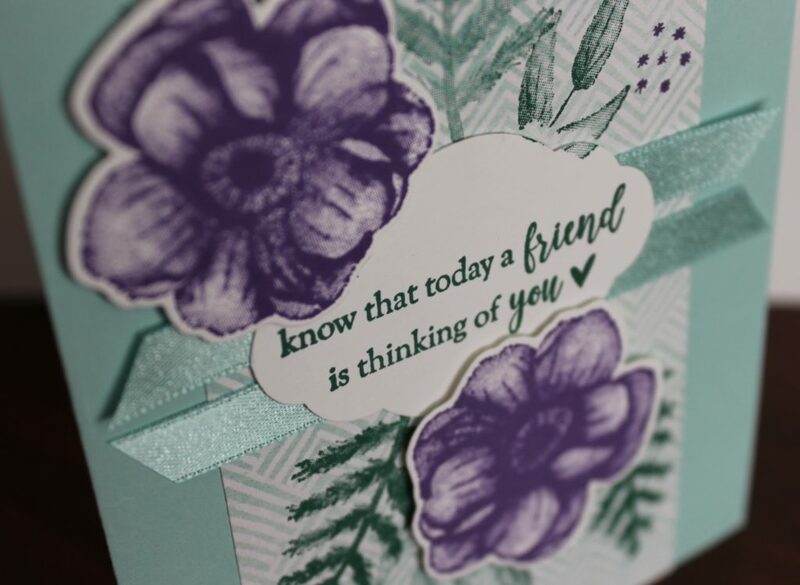 It won’t feel secure at this time but when you place the stamped floral image over the top with Stampin’ Dimensionals, that will secure it better. For the floral piece I used Soft Sea Foam and Lovely Lipstick Inks. Reveal of the Incredible Like You Project Kit!!! Project Kits are awesome because all the supplies are pre-cut and prepared for you to just relax and create! The Incredible Like You Project Kit is even more fabulous because it has bright colors and fabulous designs. The moment I saw it, I knew I had to have it. You all know I love bright colors!!! They are so beautiful and really simple to assemble. I love the greetings in the coordinating Incredible Like You Stamp Set! Perfect for any type of card/occasion! A few tips I wanted to share as I put this kit together. First off, I’m not a fan of Multi-purpose Liquid Glue. I tend to use to much and make a big mess. I used the Fine Tip Glue Pen instead. Also, you do not need to add adhesive to every spot of the die-cut pieces. I did the corners on the left two cards (adding Snail to the center of the blue floral one). For the oranges/lemons card, I did the corners and then a few random dots here and there. Click here to get your kit!! Stamp all of your greetings at once and then start your assembly. This will make it all go much faster. The last tip is to have fun with it. Feel free to use other favorite greetings of yours or different colors. Enjoy it!!! If you would like to see all the goodies in the Incredible Like You Project Kit, check out the video below or click here! Be sure to give the video a thumbs up if you liked it and don’t forget to subscribe if you are new. If you would like a notification when I post a new video, be sure to click the bell right next to the subscribe!!! Happy Monday! I hope you all had a wonderful weekend!!! We are in full swing of the Occasions Mini Catalog & Sale-A-Bration!!! 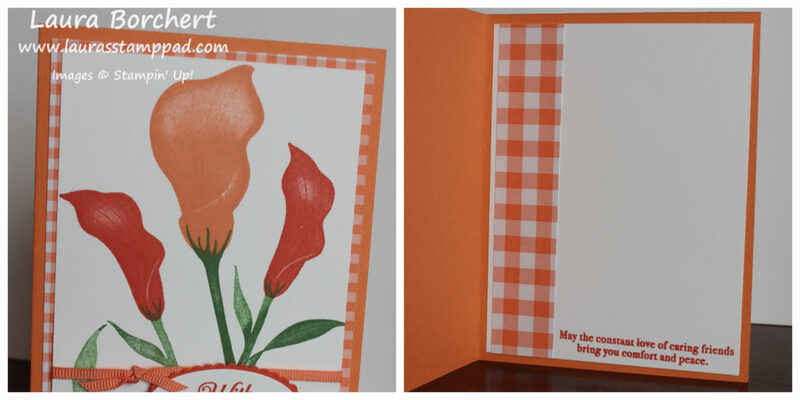 Today, I’m sharing with you this lovely Lasting Lily card that I created! I love the soft look of this card and how easy it is! 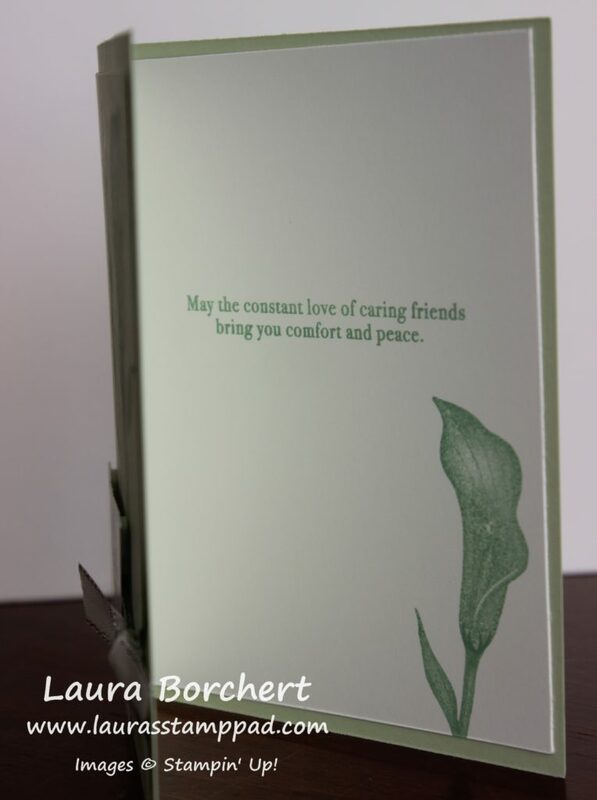 The greeting is perfect for thinking of you, sympathy, I’m sorry, and many other occasions! I started with a Soft Sea Foam card base. Next, I took another piece of Soft Sea Foam measuring 5″ x 3-3/4″ and stamped the lilies from the Lasting Lily Stamp Set. This is one of the $100 level free sets you can earn through Sale-A-Bration. It has tons of greetings for both the inside and outside. The flowers and stems were all stamped in Mint Macaron Ink. Before adding this piece to the card front, I punched out a half circle on the right edge using the 3/4″ Circle Punch. This gives a little tab to secure some ribbon! I tied some Silver Metallic Edge Ribbon around the cardstock and into a knot. For the greeting, I used a piece of Whisper White measuring 1-1/2″ x 3″ and stamped the greeting from the Lasting Lily Stamp Set. Using the Banner Triple Punch, I punched the banner tips. 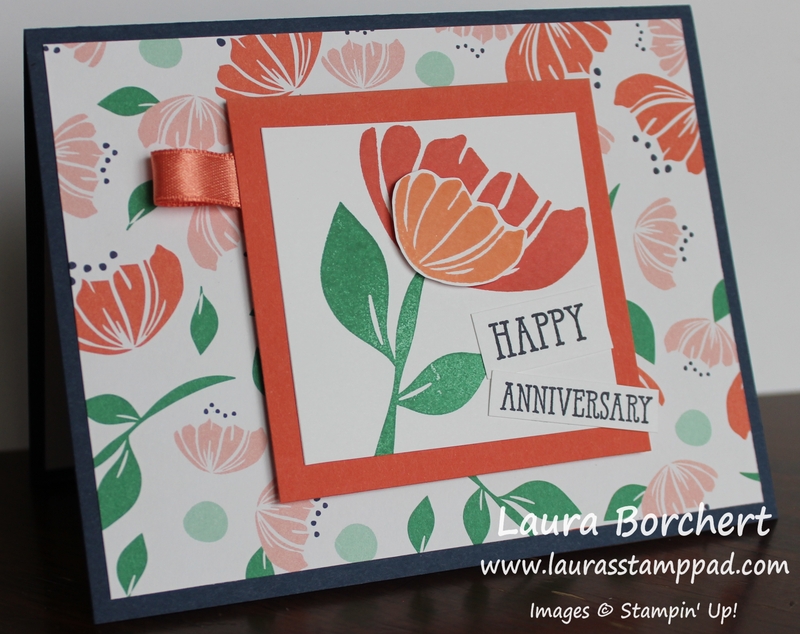 The greeting was added to the card front with Stampin’ Dimensionals for a little bit of texture!